Trying out yours.org for the first time. As a test I'm posting these four "meme images" that I've previously put together. Beneath this mask there is an idea. And ideas are bulletproof. At first I was going to name this image "B for Bitcoin" but I think it's better to point out that Bitcoin is meant to be cash ("B, it's for Cash"). It is also reminiscent of the term "bcash", which is usually said in a negative way but in all honestly it could just be seen as a reminder of that whatever they are referring to is the cash version of Bitcoin. Unfortunately no one can be told what the Blockchain is... You have to see it for yourself. 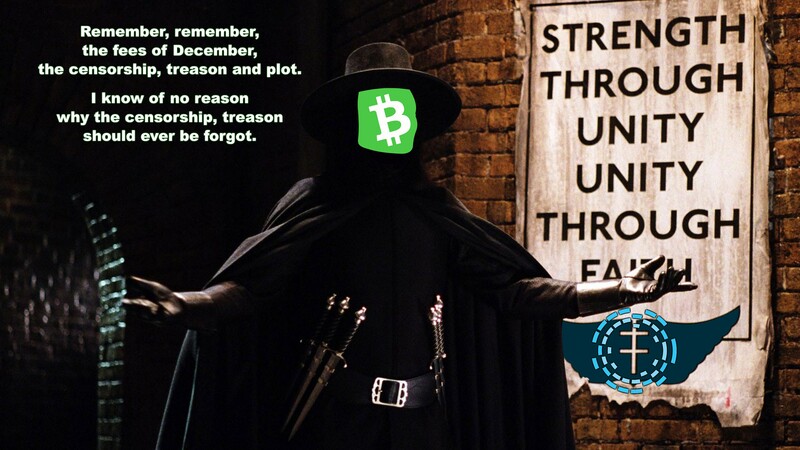 This is just an edit of an old Bitcoin meme with improved resolution and "bitcoin cash" instead of "bitcoin". I wrote the name in lower case since I was careful to make everything as close to the original as I could. Unfortunately I couldn't find the correct font but this is close enough. "Thought you said you cared about on-chain transactions again?" "I do. I think maybe I'll create some." When you go offline in the Lightning Network you're at risk of losing your funds. To try and solve this issue they plan to have Watchtowers that look over your channel. Yet another layer of complexity. This is an edit, originally the speech bubbles said "No thanks!" and "We are too busy" however I think that incorrectly implies that more is happening on BTC than BCH, that they are "busy innovating". 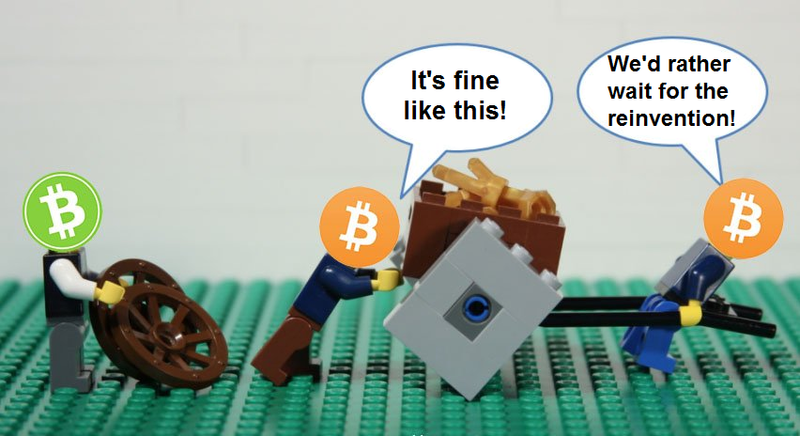 With this edit the speech bubble instead say something about the stubbornness of BTC; here BCH is offering a simple solution to scaling yet BTC would rather wait for the reinvention of the wheel than to simply use what already works. A meme can say a lot, even if it only serves as a reminder to something that the viewer had previously realized on his own but later forgotten. 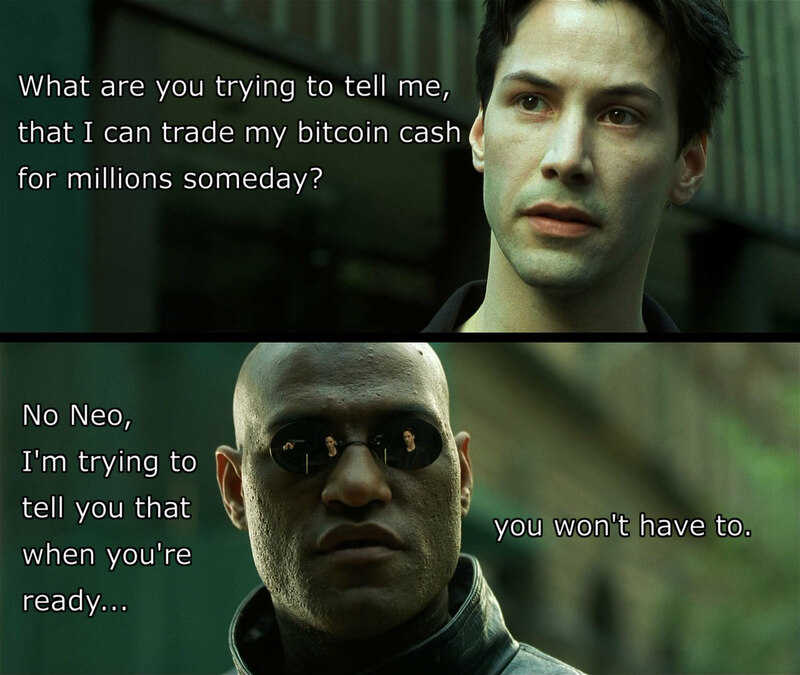 Note 1: I don't know why made the original Matrix meme or the original Lego meme. Note 2: The paid content below is basically just a thank you.